Okay, boys and girls!! Now we are really reaching back to ancient history. I don't know why, or how, but I have a book of my drawings that date back to 1964!! So, this page shows my great artistic prowess when I was in the fourth grade!! I am not sure one could call me a child prodigy. Don't you love the salt-flat racer???? Of course, everyone wishes they could drag race a shopping cart! Anyway, hot rods were a big deal in 1964. 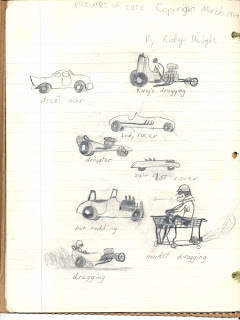 This was during the Hey Day of Ed "Big Daddy" Roth, and Rat Fink. I had a bunch of models of Rat Fink and other monster hod rods that I had built and painted. So, this page shows my rendition of their work. Also, you have to love the signature of the artist. Who was that guy anyway???? ?